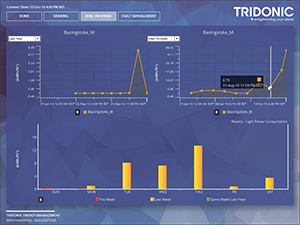 Tridonic announced the availability of a new Lighting Dashboard to supplement its recently introduced connecDIM lighting control solution. The benefit of the dashboard is that not only does it interface with the connecDIM system, but it also opens up the opportunity for the Tridonic system to integrate with HVAC Building Management Systems. The dashboard has been developed on the Tridium Niagara Platform by Forest Rock who worked closely with a number of Tridonic customers to understand the best format for the data. For example the dashboard allows the FM manager to rank sites across their portfolio from a perspective of kWh/sq ft lighting efficiency. This supplements the already highly successful cloud based, connecDIM lighting control solution which uses DALI protocol to monitor energy usage, fault conditions and emergency lighting from each luminaire across a client’s full range of sites. This entry was posted in News and tagged Controls, Facilities Management, Lighting, Solutions. Bookmark the permalink.